Removing the nav parameter changes nothing, afaict. What I would like is a "fast-forward to comic No. xyz"-feature. you do good work and your creation is unlike most in that it actually has all the things i need. When a site reorganizes its URL structure, it is common to redirect old page to their new location. This plays poorly with the Android reader, since such pages get sent to the browser. I suggest checking the first/next URLs periodically for redirection, and updating and reindexing if so. Creator or comic rocket based achievement system for reading, subscribing, claiming, etc. Add to social profile for folks to display their support/archive binges. There are many comics that I'm caught up with but I can't seem to find a way to set my current comic to being the newest one. Stop linking to Duck comics site - just link to the actual comic! 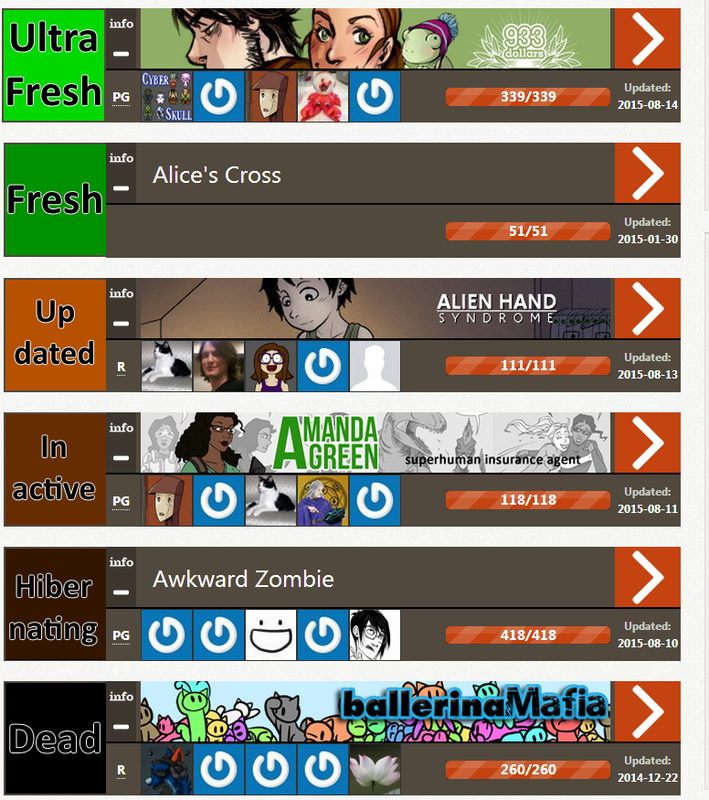 I use the bookmarklets for comics with framekillers and it works great. However, I like to go back to the comic info page if I stop reading that comic for any reason. A framekiller makes that really hard to do. Could someone make a bookmarklet that would take me to the comic info page of whichever comic I am reading? Where ultra fresh means it updated in the last week, fresh means in the last two-three weeks, all the way down to where hibernating means it hasn't updated in 5 months, and dead means it's been 1+ year(s) since it updated. I know there are the updated dates in the corner, but maybe this can be a UI revamp? All buttons on that lines becomes several pixels wide. It became a little hard to navigate. Fix whatever broke support for Feedreader around Dec 1. My rss reader, Feedreader, is unable to download the rss feeds. It last worked Nov 30, 2012 and first failed on Dec 3, 2012 (I don't update on the weekends). I can download the rss feed content via a browser and if I host the resulting file on my own webserver, Feedreader is able to process the contents. I tried dropping the feed and re-adding it and Feedreader ends up endlessly waiting for something and the feed is never added. While the < and > icons should take you to the previous and next pages respectively. There's an impressive ~300 pages unindexed. Thanks! Content rating based on user votes OR flagging. There are too many inappropriately rated comics (labled PG) with full-blown obscene & explicit material- most of which are locked by their authors. I cannot describe how frustrating it is to not trust any given content ratings, and by how many authors are getting away with exploiting the ratings to get more views.